Seasonal Splendors has the best customer service. There is always someone with a smile who will help you out. They offer a wide assortment of healthy annuals and perennials. 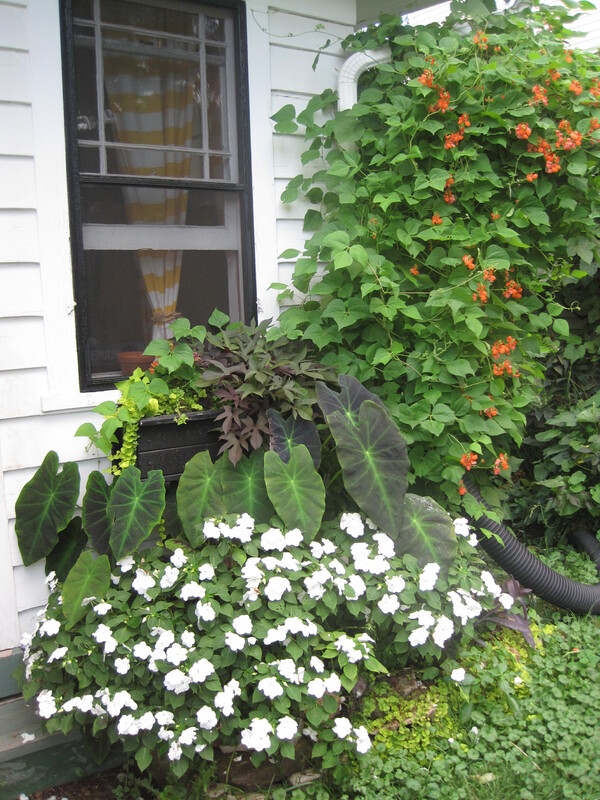 I learned about my favorite elephant ear–King of the Nile, West Indian Kale–there last year and bought fishnet-stocking coleus as well as scarlet runner bean. They also sell fabulous pots and will take the time to find just the right plants for them. Winterland Nursery is right next door and has any kind of shrub or tree you might be looking for. I found nice-sized, healthy Annabelle hydrangeas there last year. Johannsen’s is the best store for both the beginner and advanced gardener. I would highly recommend going there if you are a new gardener, as they do an excellent job keeping perennials separate from annuals and tropicals. In other stores this can be confusing, and when you are first starting out, you might think you are buying a perennial when you are really buying a tropical. 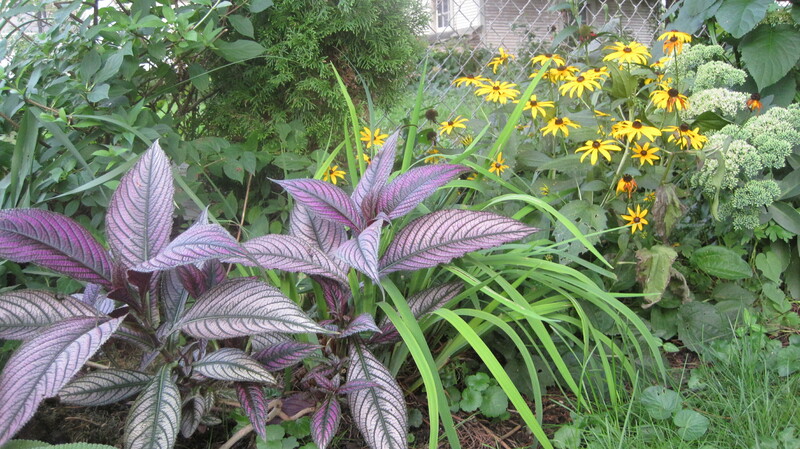 For example, last spring I saw tropicals clearly labeled as perennials in a big-box store. I knew those tropicals would not be hardy in our zone, but a novice gardener might buy them and then think they have a brown thumb and give up. Johannsen’s also has very fair prices, and my favorite part is they always help you out to your car. Always! So they are my favorite place to go with kids! In my opinion, Jung’s has the best selection of winter greens. 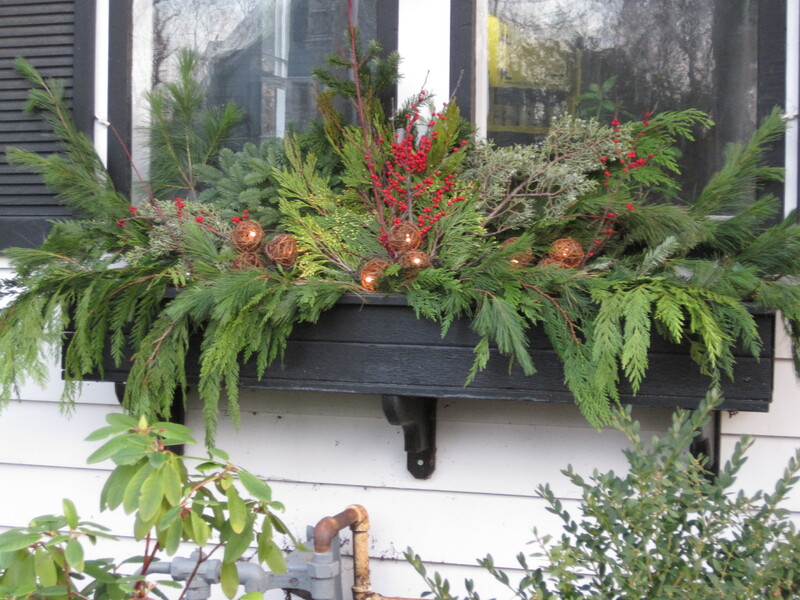 You can get roping of all kinds, wreaths, and every kind of evergreen to stuff planters and window boxes. We always buy our Christmas tree at Jung’s. I also love Jung’s for their grass seed. They sell a high-quality grass seed at a reasonable price, and it is not treated with chemicals. They are a great store if you are looking for annuals, perennials, trees or shrubs. I love going to the Farmers’ Market. My kids love, love, love going to the Farmers’ market too. I found the best celosia last year at the Farmers’ Market and will buy a couple of flats of it this year. I always buy my old-fashioned climbing petunias from Almost There Farm at the Hilldale Farmers’ Market. Almost There Farm has loads of healthy annuals and perennials for sale at the Farmers’ Market. If you haven’t been to the Hilldale Farmers’ Market recently, check it out. It gets Most Improved. Last year they had music and popcorn, and it’s very kid-friendly, especially on a Wednesday morning. The Bruce Company is an excellent store. It is so dependable. They always have what I am looking for, even late in the season. So if you happen to see something you simply must have later in the season and you want to try it out, chances are The Bruce Company will still have it. I bought fabulous artichokes there last year. The Bruce Company is also great if you have any tough horticulture questions. They are great even over the phone. They also carry my favorite seeds: Seed Savers. So if you have procrastinated and not ordered your seeds, pop in to The Bruce Company and you can start your seeds today. I tried Klein’s Floral & Greenhouses for the first time last summer, after hearing their presentation at Garden Expo. I had a hard time the summer before finding King Tut grass, and they promised they would be well-stocked. They were well-stocked not only with King Tut grass, but with everything else I wanted and needed. I bought one of my biggest 2010 garden hits there: ornamental millet. I can’t wait to shop there again in 2011. I had the opportunity to purchase plants from Garden To Be last spring. Everything I grew from them was so successful: the best indeterminate tomatoes and 5 different types of basil (the lemon basil was a family favorite). I can’t wait to place my order this year. They have the best edibles. Basil, thyme and tomatoes, oh my! The best way to find them is by email. Felly’s has the best dinner-plate dahlias up and growing strong. They, too, have a great assortment of everything: edibles, shrubs, roses, annuals, perennials. Whole Foods sells very healthy plants, and everything I buy from them does exceptionally well. They have an excellent selection of edibles, both seeds and starter plants. While you might pay a little more here, Whole Foods proves the saying You get what you pay for. 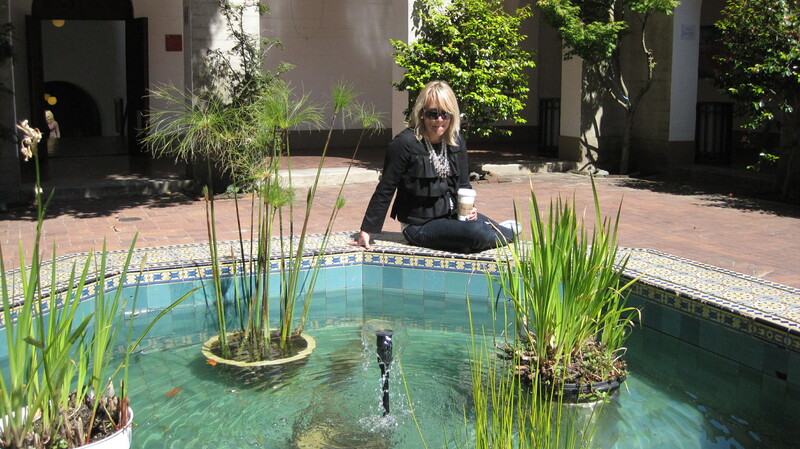 Brennan’s is a great place to find healthy edibles and tropicals. I have bought purple heart there as well as cordyline and Persian shield. They always have one of the earliest sales in summer. I finally made it to the Flower Factory last summer with one of my favorite gardening pals. What a place! This is a great day-trip to take with a friend. They have an absolutely outstanding inventory. It seems like they have every color and type of every species. For example, if you are looking for a peony, you will find every color in the rainbow there. I love your list! It’s very informative but not too lengthy. You even have some places that I have never even heard about – which will make for great spring weekend destinations. Nothing like discovering a greenhouse you’ve never been to before! I agree with your number 2 choice. Johannsen’s works very hard to get the right information to their customers. They aim to make your visit very user friendly whether you are a seasoned garden pro or an apprehensive beginner. This list also does a lot to support for small business in Madison as well! Hi! This is a great list. There is a new one on Williamson st. that is worth checking out. Its kind of small but pretty unique. http://www.madisongreenhousestore.com will take you to the website.